Chaplain, Lieutenant Colonel John F. Tillery is the Wing Chaplain, 17th Training Wing, Goodfellow Air Force Base, Texas. He assists commanders in their obligation to ensure the constitutional right to the free exercise of religion for 15,000 fire protection, special instruments, and intelligence professionals for the Department of Defense, other government agencies, and allied nations at Goodfellow AFB and at assigned units in California, Arizona and Florida. 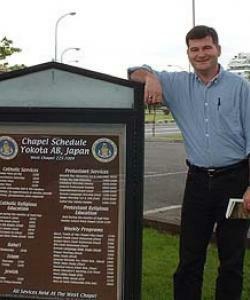 Additionally, he serves as the principal advisor to wing leadership regarding the impact of religion on the mission. Chaplain Tillery leads a ministry team of seven chaplains, three chaplain assistants, six contractors, and provides oversight for over 75 volunteers. He provides religious support for Aerospace Expeditionary Force, humanitarian deployments and other operations as required. Chaplain Tillery served on a Forward Observer team in the US Army Field Artillery (‘72-‘76) before he began his ministry among the Plymouth Brethren in 1977. During his pastoral career he served as the associate pastor of the Arab Church of Dallas in Dallas, Texas (‘84-‘87); Pastor of Denali Bible Chapel in Fairbanks, Alaska (‘87-‘91); Academic Dean of the Jordanian Evangelical Theological Seminary (‘91-‘92); pastor of the International Church in Amman, Amman, Jordan (‘92-‘96). In 1996 he joined the United States Air Force. He is a veteran of Operations Southern Watch, Desert Fox, Joint Forge and Unified Protector.